Smithsonian research station at Carrie Bow Caye. Our final day in Belize dawned bright and early, as always. With sandwiches and snorkels in hand, we said our final goodbyes to the palm trees and composting toilets of Glover’s Reef and made our way out of the atoll. Our first stop before Belize City was Carrie Bow Caye, a Smithsonian research facility housed on a speck of an island in the Caribbean. We were able to meet a crab researcher that’s been studying the incredible diversity of Belizean reefs for over 30 years at Carrie Bow. 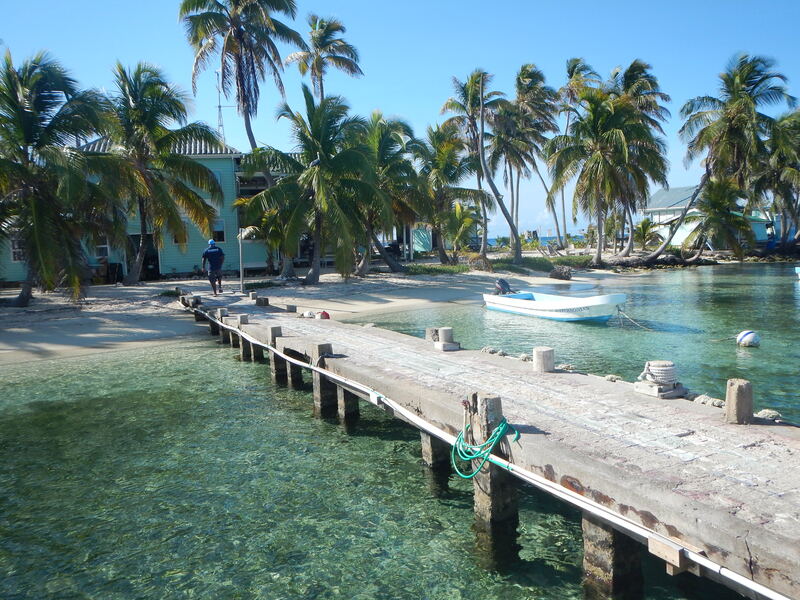 We then stopped at Twin Caye, an aptly named mangrove island that’s split in two by a channel. We first walked and then snorkeled through the muggy mangroves, carefully picking our way through their stilted roots. Mangroves may just look like odd trees from above the surface, but underwater they’re an important habitat for sponges and act as fish nurseries. 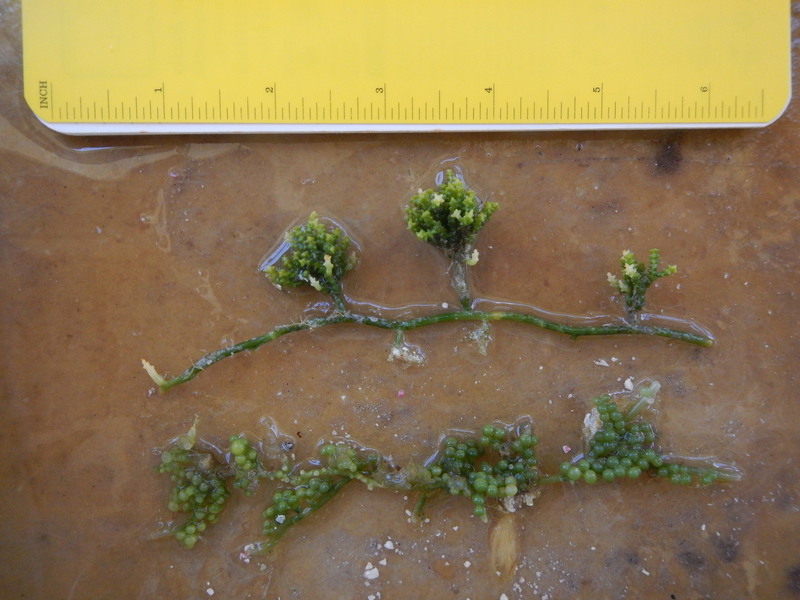 I wasn’t able to identify any herbivorous fish species, but the mangrove roots were swarming with tiny juvenile fish for this reason. I even saw an adorable baby barracuda! (I think this trip has given me a new definition for cute). And with that, we were off to the marina in Belize City. After an incredibly long lunch at the infamous Calypso restaurant, we made our way to the airport. Before I knew it, we were waving goodbye to this beautiful country, several bottles of hot sauce heavier than when we arrived. Sadly, today was our last day. We set out from Middle Caye at 7am and stopped at two other Cayes on our way back to Belize City. The first Caye we stopped at was Carrie Bow, which is a Smithsonian Institute research site. It’s a super small island near South Water Caye, and it’s beautiful. They gave us a tour and we got to talk to a crab researcher who has been working there almost since they opened in 1972. The second Caye we stopped at was Twin Caye, which is a mangrove island split down the middle by a channel. We walked in the mangroves and I got to see the pores that the red mangroves use for getting oxygen. We also got to see the yellow leaves that the mangrove diverts salt to in order to save the rest of its leaves. After walking in the mangroves we snorkeled through the channel. I sadly did not see any sea hares, but I did see some clams on the mangrove roots. I also saw the sponges that mangrove roots have a symbiosis with, a whole ton of baby fish (mangroves are fish nurseries), some magnificent feather duster worms, and a huge barracuda. The barracuda was hiding in the roots of a mangrove and I almost didn’t see it until I was basically right in its face. It flashed its teeth at me as I backed up. After the Cayes we had our last meal in Belize at Calypso. They took a predictably long time, but it was still very tasty having fresh fish while looking out at the ocean it came from. Our plane ride was short and bittersweet, and although we had to sit on the tarmac for awhile, it seems like our curse of terrible transportation has been defeated. I’m sad to be going, but I’m sure I’ll be back. This morning we bid farewell to Glover’s reef. We then took the boat to Carrie Bow, a nearby Smithsonian research station. There was a couple living at the station for the month as managers, and apparently it’s relatively easy to land a volunteer station manager position at the station. That sounds like an awesome way to spend a month. Next, we went to an island completely covered in mangroves. We walked a little ways through the island and saw lots of young fish using the mangrove roots for protection. We then snorkeled around the island. The water was pretty murky, but I did find some sort of branching, calciferous red algae covered in sediment. I didn’t want to dive down to look at it because the seafloor was also covered in upside-down jellyfishes that flip over and bob around when you kick too close to them. I am on the plane, flying back to Houston. It’s hard to believe that in just a few hours I will be in an air-conditioned home, take my first warm shower in 2 weeks, and change into clothes that were washed in a machine instead of a sink. This will definitely be nice, but I can’t say I’m super excited to return to the city. Belize is such an amazing country and I can’t wait to return some day. We’ve packed and left Glover’s to perform one last tour of the Carrie Bow Cay and a final dive in the Twin Caye mangroves, a habitat with unique saline-tolerant trees that not only serve as a great fish nursery from many ocean fishes, but also as a carbon reserve that takes more CO2 from the atmosphere than many other tree biomes, making their conservation a priority. While the insides of mangroves are oxygen poor and harsh, the edges of a mangrove forest harbor diverse life forms ranging from sponges, to juvenile fishes, to magnificent feather duster worms, and most importantly to me, jellyfishes. The mangroves are carpeted with two species of jellyfish: Cassiopea frondosa and Cassiopea xamachana. These guys are also known as upside down jellyfishes, since they orient their tentacles upwards to energize the photosynthetic symbionts that live in there, similar to how corals foster photosynthetic algae in their polyps. These symbionts give each jellyfish a different color, ranging from yellow to orange to even green. With the hundreds of jellyfishes that lay on the sea floor, it was almost like a carpet mosaic. Adrienne, one of our instructors this trip, wondered why more jellyfish hadn’t adopted this kind of lifestyle, considering how numerous and successful the upside down jellyfishes were. We also wondered whether these guys could be a transition between sedentary polyps that have symbiotic algae and free-swimming jellyfishes that feed on prey. I need to brood on these questions for a bit, but I’m not sure I’ll find an answer to this evolutionary problem. For now, I need to consolidate my thoughts on the fact of leaving the country. I’ll make sure to update you all on my final thoughts and musings. Definitely felt a lifetime pass in just two weeks and can’t wait to share all the pictures! Hello everyone! Once again, the sunrise was unbelievably (or should I say unBelizably?) beautiful and the perfect way to begin our last day in Belize. We left Glover’s Reef early this morning and took a boat out to Carrie Bow Cay Marine Field Station. It was a cool place, but learning that global climate change could lead to rising water levels that could make the island disappear completely made me sad. 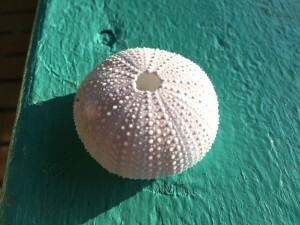 During a quick tour of the quaint research facilities, I saw quite a few echinoderms that had been dried or preserved. Most notably, there were some slate pencil urchins (Eucidaris tribuloides) and a large red heart urchin (Meoma ventricosa) along their balcony railings. We then headed to Twin Cayes to snorkel among the mangroves in the channel that gives the islands their name. 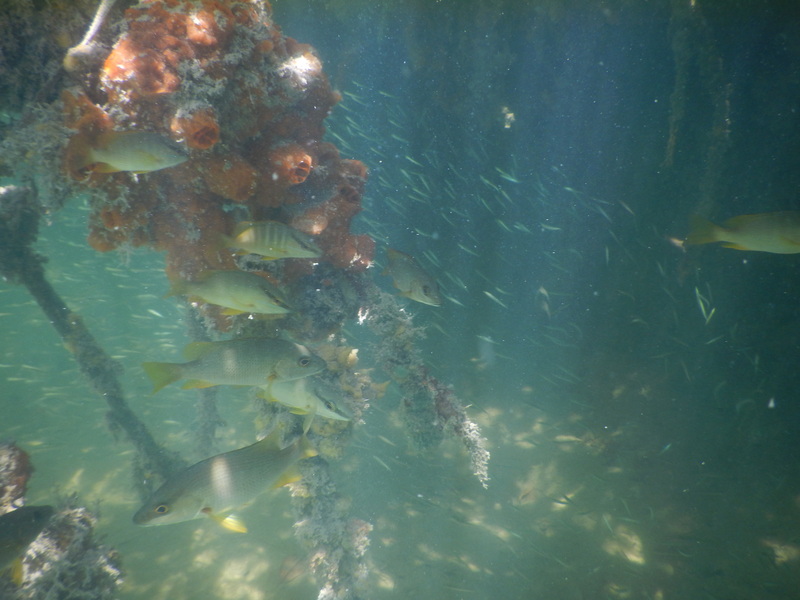 The waters here were really murky, with lots of loose sediment that was easily kicked up by our fins, so it was a little hard to see at times. However, I did identify several large bright orange cushioned stars (Oreaster reticulatus) lying in the sand near algae patches. 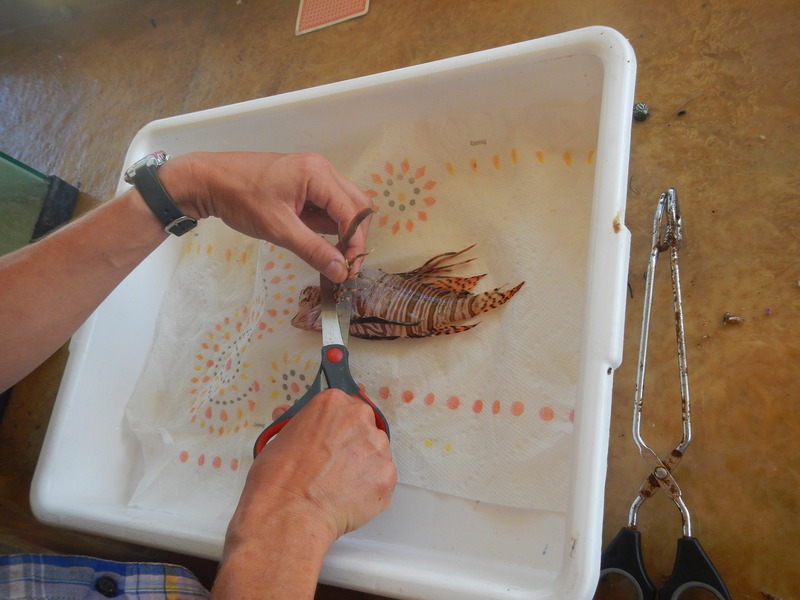 It was fun to be able to hold them and feel the short knobby spines on their dorsal side. 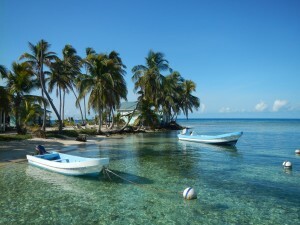 Too soon, our last snorkel in Belize was finished and we climbed back aboard the boat to ride to Princess Marina. One week in the Rainforest. One week on the coral reef. As different as the two ecosystems sound, in a lot of ways they are similar. Both are hotspots for biological diversity, driven by diverse geography and topographical features which create countless niches to be filled. 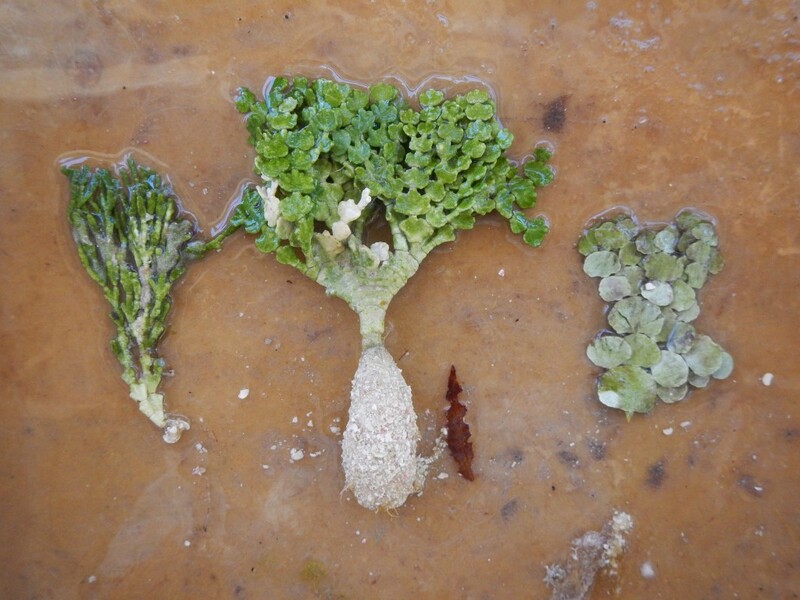 The niches are filled in fact by huge ranges of organisms that have adapted to suit their microenvironments. For example in both the rainforest and in coral reefs, light penetration plays a role in determining the organisms that will survive and thrive in different locations. High light-need species reach the heights of the canopy in the rainforest; they reside in shallow waters on the reef. Other factors include resilience in inclement weather, particularly in countries like Belize. Belize is affected by tropical weather systems such as hurricanes, which may reshape the ecosystems and the organisms that are not sheltered must be able to survive the effects. This is true in both the forest and the reef, as exposed species in either are at risk. Another similarity I have noticed is the apparent paradox of high biological diversity in spite of nutrient poor environments. Both reefs and forests support incredible richness and abundance of life. In nutrient poor environments this is made possible by the efficient cycling of the nutrients that are present. In fact, the ecosystems themselves are in a way nutrient rich, in that the nutrients are usually actively being used by the occupants. This course was what I expected, but better. I had expected to find a bit of direction and to maybe make some friends. I have found such reassurance in this course: reassurance of wanting to pursue biology and perhaps marine biology in particular. And the group of people on this trip are each individually important in creating the amazing group dynamic we had. This also includes the instructors, who are passionate about the material and make me feel passionate about it as well. My favorite part of this trip was snorkeling the fore reef. I remember letting myself bob in the waves and then someone pointed down. There was a huge spotted eagle ray swimming right below us. Seeing something like that in its natural environment was incredible. My least favorite part of this trip was the itching. Between chigger, tick, sand fly, and mosquito bites, there are more bites on me than I can count. Incidentally I apparently also have a fairly strong reaction to most of those bites. I have never before woken up in the middle of the night due to itching so badly. Sometimes it is easiest to believe that there is a simple right and wrong, but that’s hardly ever the case. This trip reminded me of that. It would be nice to say that all poaching is inexcusable and conservation should be the easy answer. That, however, is not the world we live in. Hearing more about conflicts between Guatemala and Belize have reminded me of that. I’m going to try very hard not to forget it. I know that in pursuing science, sometimes the answers we end up with are not the ones we want to hear. I will not always be correct. In fact, most of the time I will probably be wrong. There are a lot of things worth trying to save in this world. I cannot save all of them. I am not in control. So I am going to try and save a small piece of it. Today we made our way back to Houston- not too quickly though, of course. Who would want to leave the beach? I am however okay with taking a break from the sand flies. This morning we packed the boat up again and took off. First stop was Carrie Bow Caye, home of a Smithsonian institute research station. We got to take a tour of the facilities on the very small island. In fact the island is shrinking due to rises in sea level and is now about the size of half an acre. It was a functional lab in the field biology sense: a wet lab, dry lab, library, and boats for use. I’d definitely want the chance to research here. 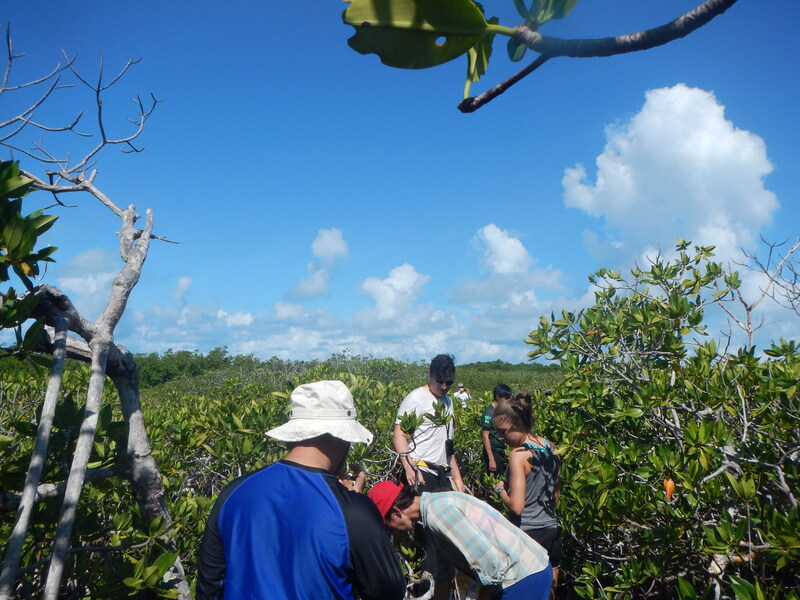 The next stop was at Twin Caye, an island split in two and covered with mangrove ecosystem. We tromped through the mangroves and then took to the water to snorkel one last time. I did not see any anemones, zoanthids or corallimorphs, but in fact I didn’t see much at all. 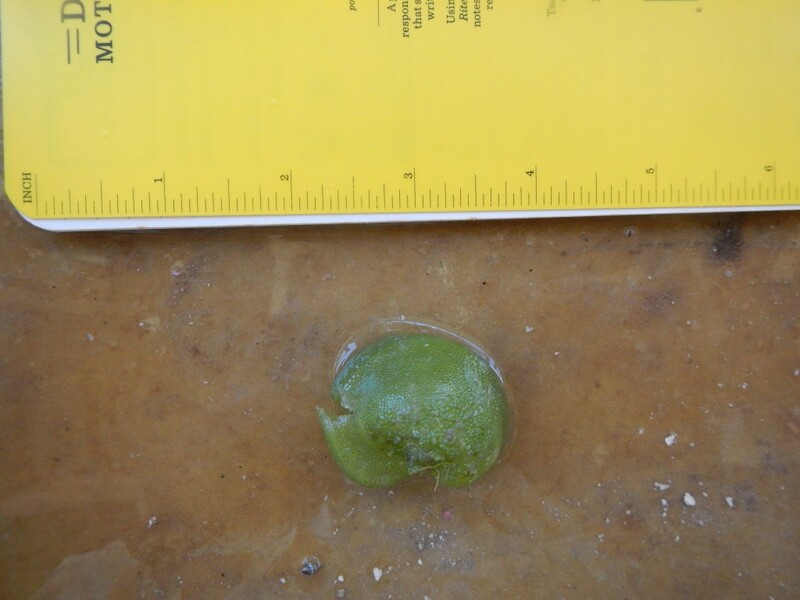 Being in the mangroves, there was a lot of loose sediment that made the water fairy murky. 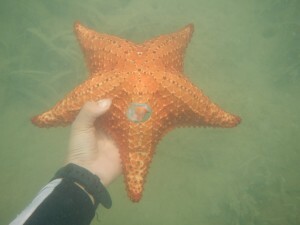 I did see upside down jelly fish(Cassiopea…), a cushion sea star, and a lot of juvenile fish. Another short boat ride and we were back in Belize City to eat lunch and head to the airport. Officially over when we reached Rice University, EBIO 319 is complete. Even on our way to the airport we managed to squeeze in one last snorkel. This time we went to the mangroves and swam around their roots, which many organisms use as a substrate to grow on. Fish also use mangroves as a nursery where they are fairly sheltered from larger predators. Upside-down jellies bobbed along the bottom of the sea bed and fire sponge glowed orange through the murky water. 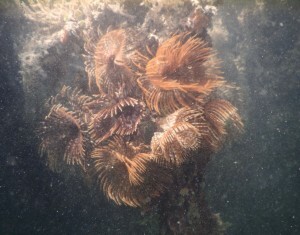 I finally saw the magnificent feather duster, recognizable by its larger size and double crown of radioles. 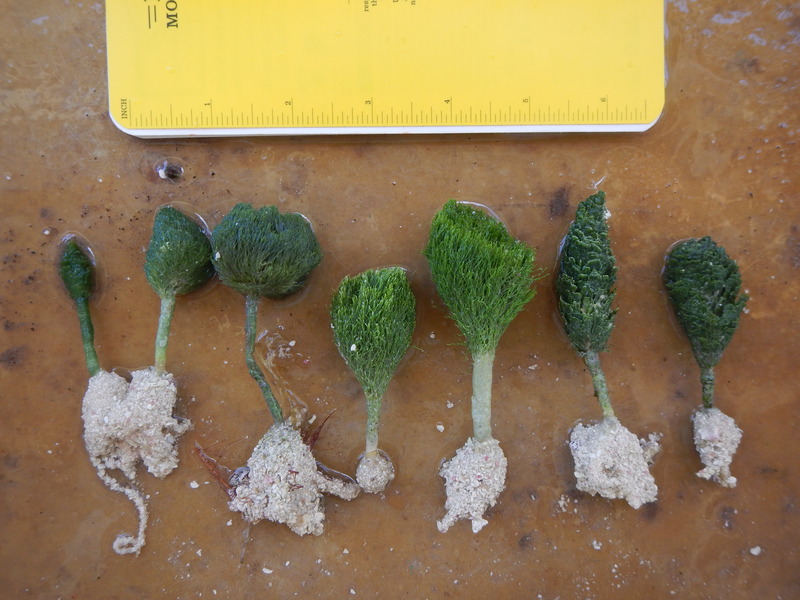 Their tubes were attached to the mangrove roots, among the encrusting algae, sponges and hydroids. They were various shades of brown and white and tucked their filter-feeding radioles into their tubes if you touched them. Unlike the other feather dusters I’ve seen, they didn’t tuck their radioles in all the way, and the tips of the crown poked out of the tube. I am guessing this is because they are too big to fit all the way in. Time has never passed so quickly as it did on this trip. We were so busy and there was so much to do and see that the two weeks were over before I knew it. I was never bored for a second. Being back in Houston is so strange and claustrophobic. I already miss the fresh air and pristine nature. I’d take that over clean laundry any day!